How to copy and paste very often used when working with images in Adobe Photoshop. This is a straightforward operation, the application of which more time is spent not in the operations themselves, and the preparatory procedure - basically it refers to the selection region process on the source layer of the picture. Run the GUI editor, and then load the image with which to work. If it is stored in native format Photoshop (psd), simply double-click it to implement both of these actions. Otherwise, after launching the application, just drag the file into the program window. 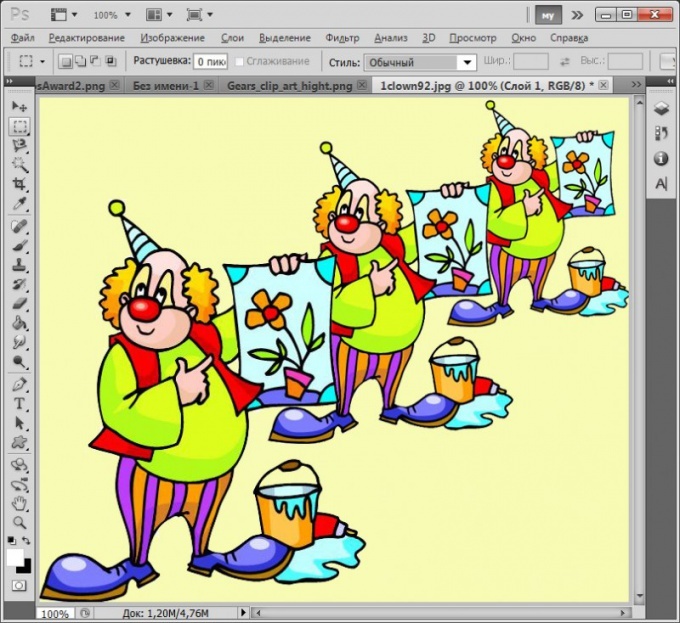 In psd files of the images can be stored in multiple layers. If you only need to copy the contents of one of them, click on the row in the layers panel. Highlight the picture area of the backup. To hold her the whole picture, just press Ctrl + A, and in other cases you need to enable one of the selection tools. On the toolbar, for it has three buttons, each of which has attached several versions of the tool. Switch the active variant is carried out using the drop-down list that opens which should click an appropriate icon, right-click and hold for a few seconds. To highlight a rectangular or oval area of the image click the second icon in the toolbar, or click button on the keyboard with the Latin letter M. Then move the mouse pointer, for example, on the upper left corner of the desired area, left click and hold, move the cursor to the bottom right corner. Three tools caused the following toolbar button (or by pressing L), allow to allocate a region of arbitrary shape. Use them the same way as the previous tool. For the fourth button (W) is equipped with two tools that allow you to select the image region with similar color, brightness and other parameters. For such a selection is just a click point on the image that should serve as a model when determining similarity. By setting the copy area, press Ctrl + C and the selected area of the active layer will be placed in the clipboard. If you want to copy the combined image of all layers, use the combination Shift + Ctrl + C or select "Copy combined data" under "Edit" menu of Photoshop. Use Ctrl + V or the Paste command from the same section "Edit" to place the contents of the clipboard into an editable document.